Remembering Tricky Verb Endings. Mnemonics in the Language Classroom. Ever wonder why it’s so hard to remember verb endings? It’s because our brain is designed to forget things that have no context in the real world. Let’s face it, remembering if a verb ends in ar or ir means nothing to our survival as a human being so we forget it easily. However, we still need to teach those tricky verb endings in Spanish. Most of the time, language learners can learn these with comprehensible input activities: movie talks, level appropriate readers, and games that recycle high frequency vocabulary. These place the word in context and therefore easier to remember. Another great way is to provide a memorable picture, idea or mnemonic. For example, the image below is inherently interesting making it a great way to teach the word bombilla and the verb flotar in the present continuous: La bombilla está flotando. Since light bulbs don’t normally float, it’s an easy picture to remember, and the verb sticks in our brain. My other favorite tools are mnemonics. Here are few classics for teaching Spanish. This comical one fo the irregular Informal Tú commands. Ven Di Sal Haz Ten Ve Pon Sé Check it out with Google Images and you can find some great posters for this! I invented one to remember the Irregular Past Participles of some common verbs. It helps when teaching the past perfect and present perfect in Spanish. This crazy little character sticks in a students’ mind. Who wouldn’t remember a famous peach? Mr. V. Peach DVD. Muerto, Roto, Visto, Puesto, Escrito, Abierto, Cubierto, Hecho, Dicho, Vuelto, Descubierto. Hang on a white board or on a wall facing students so they can see it all times. I made this to fit on a three standard sized pages to give the effect of a long poster. Then, I printed them on a nice yellow card stock to give it a pop of color. Hang it up a white board with some fun magnets (I have a couple of Guatemalan magnets on mine) and you have teaching tool you can use all year. Write a few questions on the board next to the poster and you have an easy warm-up or exit ticket for your lesson. We hope you enjoy your new poster! 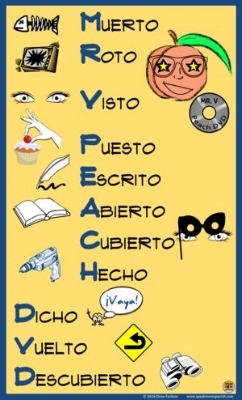 Leave a comment below about your favorite mnemonic for learning Spanish!